March 27, 2017 | 11:50 a.m.
Phosphorus applied for agricultural purposes accumulates in the soil over decades. Phosphorus is one of the most important components in the ongoing struggle to balance agricultural prosperity with water quality. When farmers fertilize their fields with this essential nutrient, plants use some, with precipitation carrying excess amounts into nearby bodies of water, fueling algal blooms that can kill fish and and endanger drinking water quality. But phosphorus that lingers in the soil, sometimes for decades, is troublesome as well. What scientists call "legacy phosphorus" — or "legacy P," a common abbreviation — exists in a sort of nutrient limbo. "There has been a growing concern over the time lag," said Melissa Motew, a PhD student at the Nelson Institute for Environmental Studies at the University of Wisconsin-Madison. "You apply phosphorus and then it stays around a long time, and it overshadows water quality remediation efforts over time." Motew and her colleagues published an article that uses computer modeling to quantify the impact legacy phosphorus has on water pollution. It's hard to say how much of the phosphorus being swept into a body of water in a torrential rainstorm is old or new. 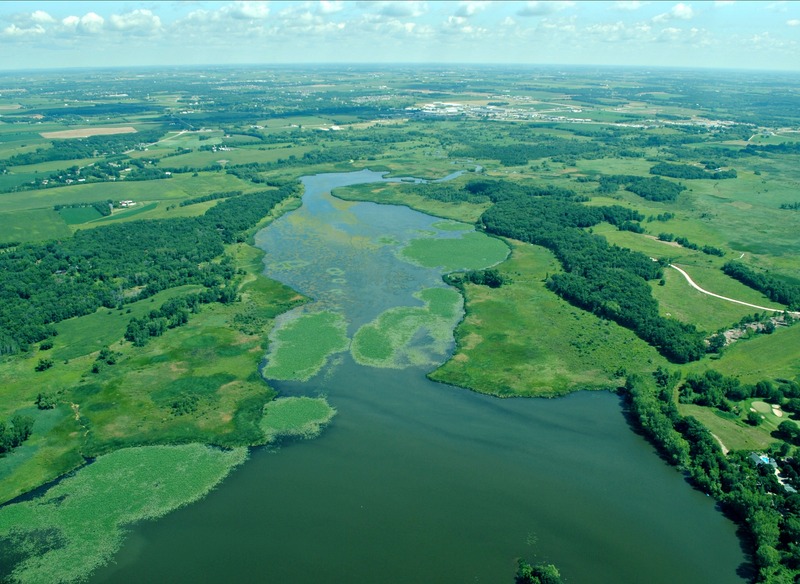 What the researchers did manage to show, by using data about phosphorus in the Madison-area Yahara River watershed, was even if farmers reduce the amount of new phosphorus they're adding to the system, those cut hardly put a dent in phosphorus pollution overall. "There is awareness that legacy phosphorus affects water quality outcomes for a long time, but there haven't been many ways to really quantify that," Motew said. Farmers can use a variety of methods now to keep phosphorus in check like rotating crops, planting cover crops, and applying fertilizer efficiently through a method known as the "4 R's." This approach have made a difference, but in the end might not be enough. "If you have extreme precipitation, for example with climate change, I think those practices are going to be overwhelmed," Motew said. Soil needs phosphorus to be healthy — about 50 parts per million is a good benchmark, said Peter Vadas, soil scientist with the United States Department of Agriculture's Agricultural Research Service and one of Motew's co-authors on the paper. It's just that intensive agriculture has introduced high levels of phosphorus to soil for decades. "It's not uncommon to see 100 or 150 [parts per million] in a field that's been getting a lot of manure, historically," Vadas said. "In other areas of the country, 100 would be low." The use of manure part where the phosphorus pollution and measurement problems really arise. Farmers using manufactured fertilizers know how much they're putting in of any given substance. Some artificial fertilizers supply a single nutrient and others multiple, but in any case, they provide farmers a level of control. Manure is prized for both its phosphorus and its nitrogen. But its chemical complexity and physical state — partly solid, partly liquid — makes its harder to predict what how these nutrients will affect the soil. "Usually we apply manure based on how much nitrogen the crops need. When we do that, typically we're applying more phosphorus than the crops need," Vadas said. But if a farmer isn't applying manure, it still has to go somewhere, and crops need another source of nitrogen. "It starts to affect the whole farm system, and that's why these issues come to be so complex," Vadas added. In addition to not over-applying manure in the first place, Motew said, farms can consider "mining" phosphorus out of the soil, and make greater use of manure digesters. These systems don't eliminate phosphorus, but can make it easier to transport manure to an area where the nutrient is more needed. Researchers who study legacy phosphorus emphasize that whatever people do about it, it might take a long time to see reductions in its soil concentration and subsequent improvements in water quality. "Once we get to this situation, it is extremely more difficult to mitigate and draw down legacy phosphorus," said Andrew Sharpley, a professor of soils and water quality at the University of Arkansas. "In most situations, [it] will be slow, and on the order of decadal in many cases." Nutrient pollution in the form of phosphorus spurs algal blooms in surface water, including on the Yahara River north of Madison. Another tricky aspect of legacy phosphorus is that it can make it hard to sort out how effective conservation measures are. "We have known for several years that some conservation measures are designed to trap runoff and nutrients on the land, and in time, these sinks for phosphorus will transition to sources — i.e., legacy phosphorus," Sharpley said. "In other words, the loss of P from these legacy sources could be masking the benefits imparted by current conservation measures." The problem of legacy phosphorus is relevant wherever people practice intensive agriculture, especially if that involves raising animals. The Madison region, with a lot of animal agriculture and urban activity clustered around a string of beloved lakes, helps to illustrate why finding a way forward is so complex. "It's hard to know what's happening across a lot of farms because every farm is different, but I also think in this watershed we still have a lot of manure production," Motew said. "We have more cows being raised on smaller plots of land, so you have more manure spread on smaller areas so that it's really concentrated. I don't know that nutrient management is actually getting better for water quality." Editor's note: This article is corrected to note Peter Vadas' job title as a soil scientist with the United States Department of Agriculture's Agricultural Research Service.